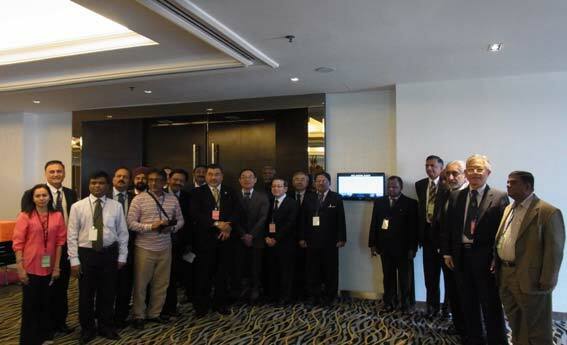 The 9th General Meeting of Asia Pacific Health Co-operative Organisation, held in Kuala Lumpur, Malaysia, was attended by 22 people from 5 countries (5 people as board members and directors and 17 people as representatives and observers). Dr. Syed Mohammad Salleh Alzawawi from KDM made a speech of welcome on behalf of the host country at the start of the general meeting. Following the speech of welcome, Dr. Takaaki Fujiwara, President of Hew Co-op Japan, made an opening speech and expressed his gratitude to Dr. Syed and the members of KDM for all their efforts to make arrangements for the general meeting. Dr. Fujiwara emphasized the increasing importance of the role of APHCO as cooperatives have shown remarkable resilience in spite of the expansion of the world-wide economic crisis and they have been active in each country. He also stated the importance of the general meeting and showed his expectation of active discussion referring to the summary of 2-year activities of APHCO, the report on activities of each country, the activity plan for fiscal year 2013 to 2015, the amendment of the subscription formula, and the election of the board members. In addition to the activity report and the financial report for two years, the participants discussed the amendment of the subscription formula in accordance with the amendment of the bylaws of APHCO, and the activity plan which was based on Quebec Declaration adopted at the 4th International Forum on Social Care and Health Cooperatives held in Quebec in October 2012 referring to Tokyo Declaration. All the bills were approved before they wrapped up the general meeting by confirming that the board meeting would be held in Japan in 2014 and the general meeting was scheduled to be held in Korea in 2015.